Our miniature pinscher – being such a very small dog – loves to sleep in a blanket. He gets tightly wound up in there and it’s like peeling back an onion to get him back out. Even in his crate at night, he buries himself into his bedding. I wash it once in a while. He will look for it while it’s gone. When it comes back, his little face just lights up. My blankie, it’s here! Oh my blankie – I missed you! He’s so excited to see it again. It’s gotten ratty over the years, but to him, it’s very special. Which is why we keep it, even if it is a bright blue that doesn’t go with anything else in the room. 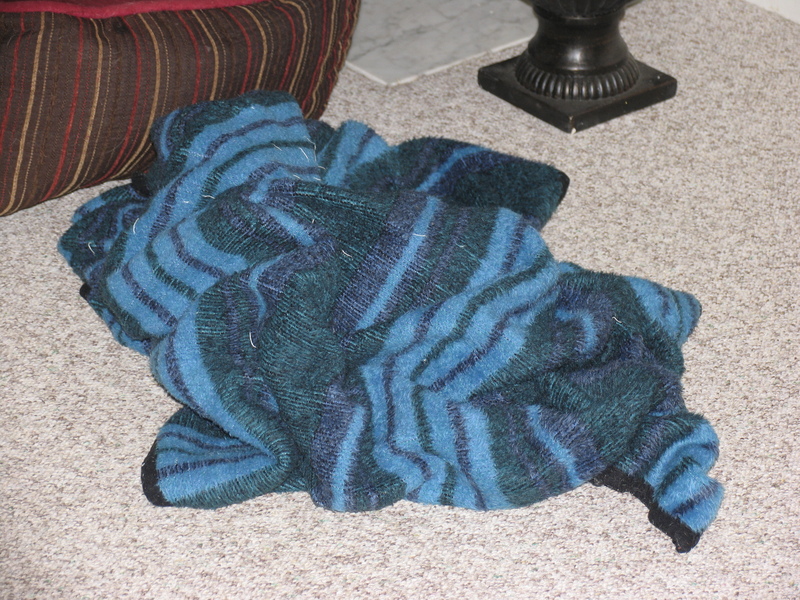 Yes, there is a dog wound up in this lump of blanket. Word for tomorrow – WELL. If you prefer to work ahead, see the list for the week under “A Word A Day”. How cute is that! Our little 10-pound peek-a-poo Arthur sometimes shivers. I try to wrap him in a blanket, but he usually gets out from under it. Count your blessings. The little guy knows how to take care of himself. Does Arthur let you put a sweater on him?� Our min pin wouldn’t wear one this winter.� Small as he was, he marched out into the snow and ice with his nearly bald tummy.� By March he grew quite a thick pelt.